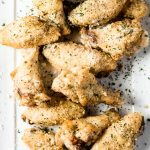 If you like your heat level at zero – then you’ll love this Garlic Parmesan Chicken Wings Recipe! Not all of our chicken wing recipes are spicy – we have everything from hot & spicy, to sweet & sticky, to simply buttery delicious. These oven-baked wings are also gluten-free and made with just a handful of easy ingredients. With no complicated cooking process, you’ll have dinner on the table in just under an hour! Sometimes you just need a wing that’s not oversauced, and that’s not hot and spicy, right? But, I’m always a little hesitant to try new wing flavors unless someone can vouch for them as being super tasty. For example, take buttery garlic wings like these – at a restaurant, I’m always afraid the wings will be way too garlicky for my tastebuds – which is why I made sure to test these wings out for the perfect amount of butter + garlic and even include recommendations for making them even more garlicky if your tastebuds desire. Plus, there’s no overcomplicated breading + cooking process with these wings. To keep them gluten-free with just the right amount of crisp – while also being oven-baked – you’ll use arrowroot powder, which is my favorite go-to coating for gluten-free chicken wings. 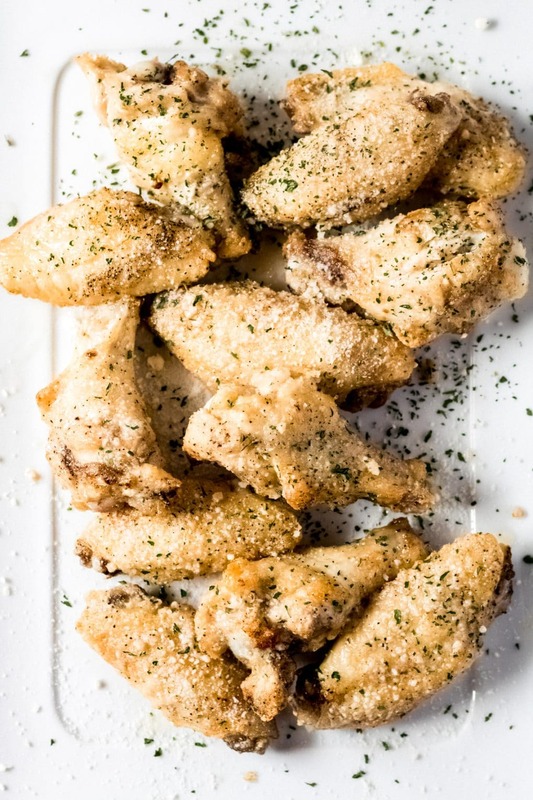 Let’s dive into making these garlic parmesan chicken wings! Season and coat the fresh chicken wings. 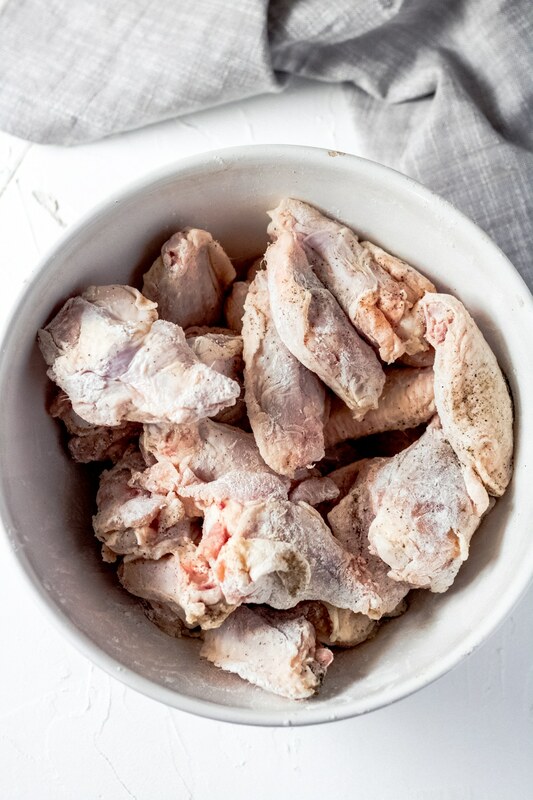 Place the fresh, not frozen, chicken wings into a large bowl and coat with three tablespoons of arrowroot powder plus 1/4 teaspoon salt and 1/4 teaspoon pepper. 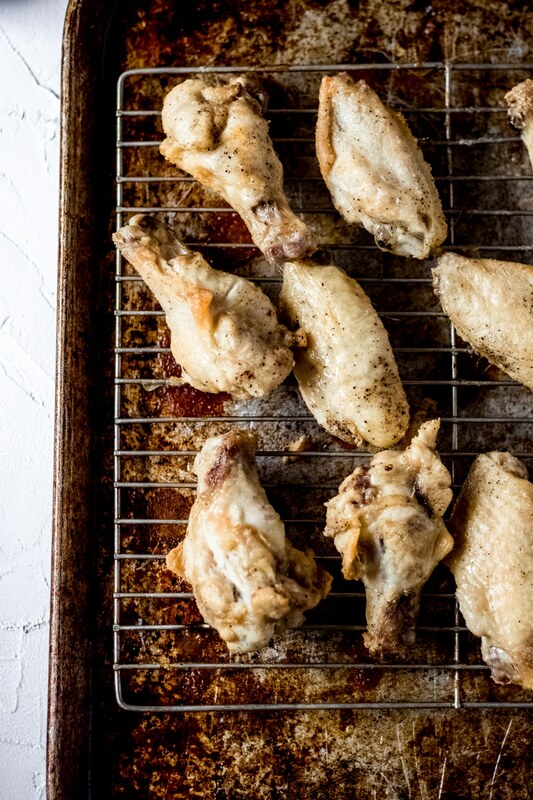 Place a cooling rack onto a baking sheet and place the wings onto the cooling rack. This keeps the wings up off of the baking sheet and allows the heat to fully encircle the entire wing while cooking. Bake for 40-45 minutes. Add 3/4 cup unsalted butter, 1/4 cup grated Parmesan cheese, 1 teaspoon. minced garlic, and 1/2 teaspoon garlic powder to a small saucepan and melt over medium heat – stirring to combine. Remove the wings from the oven once they’ve finished cooking. Ideal internal cooking temperature is 165 degrees F.
Using cooking tongs, dip each wing into the garlic parmesan sauce and set onto a plate or serving platter. Sprinkle on additional grated Parmesan cheese and garnish with chopped parsley, if desired. Serve immediately. Can chicken wings be frozen? Ideally, no – it’s better to use fresh or fully thawed wings. If you are frying your chicken wings then you absolutely cannot use frozen wings. They need to be fully thawed. Can chicken wings be cooked in a crock pot? Yes! In fact, you can check out my crock pot chicken wings recipe where I go over how to cook chicken wings in the crock pot and still get a nice charred skin on the outside. Are chicken wings white meat? The chicken wing itself is white meat, while the drum is dark meat. Most chicken wings are a combination of wings and drummettes. Can chicken wings be eaten cold? Yes – you can eat fully cooked chicken wings that have been properly refrigerated. 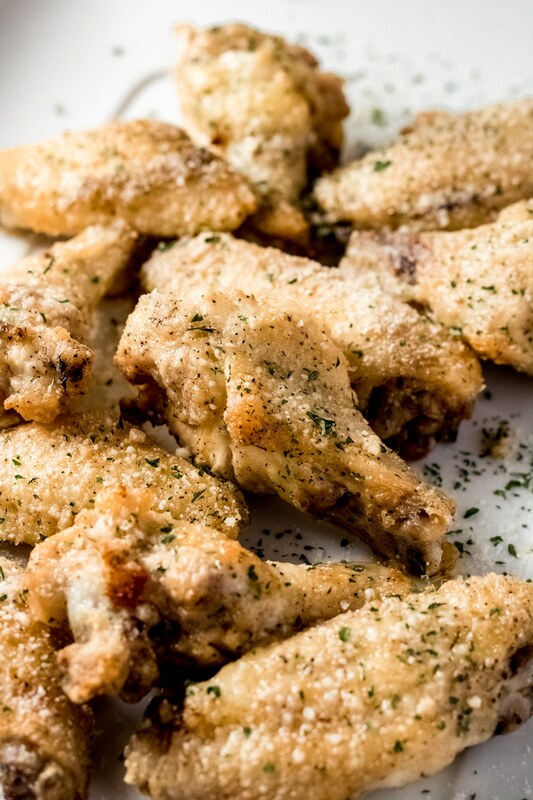 Enjoy these delicious side dishes with these garlic parmesan wings! 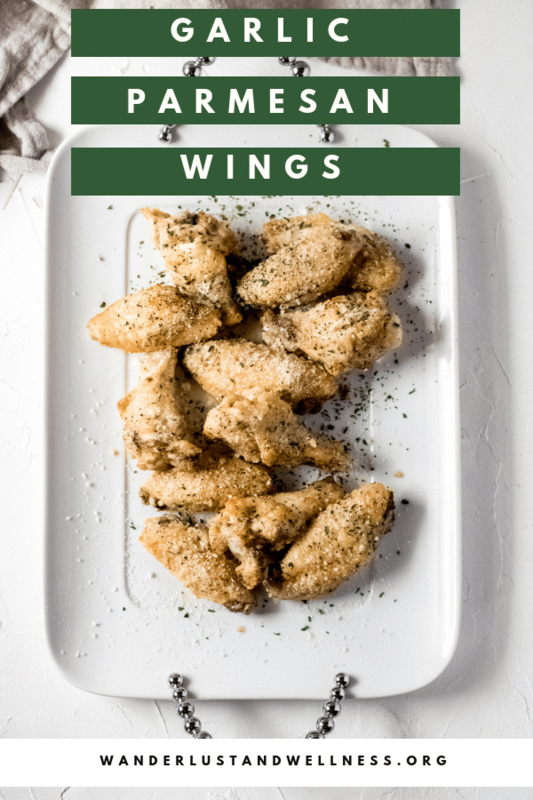 Enjoy this gluten-free garlic parmesan chicken wings recipe any day of the week! Oven-baked, and ready in under an hour. Place fresh, fully thawed, chicken wings and drummettes into a large bowl. Season with salt, pepper, and arrowroot powder and toss to coat fully. Place a baking rack onto a baking sheet and place coated wings onto the baking sheet — Bake for 40-45 minutes. 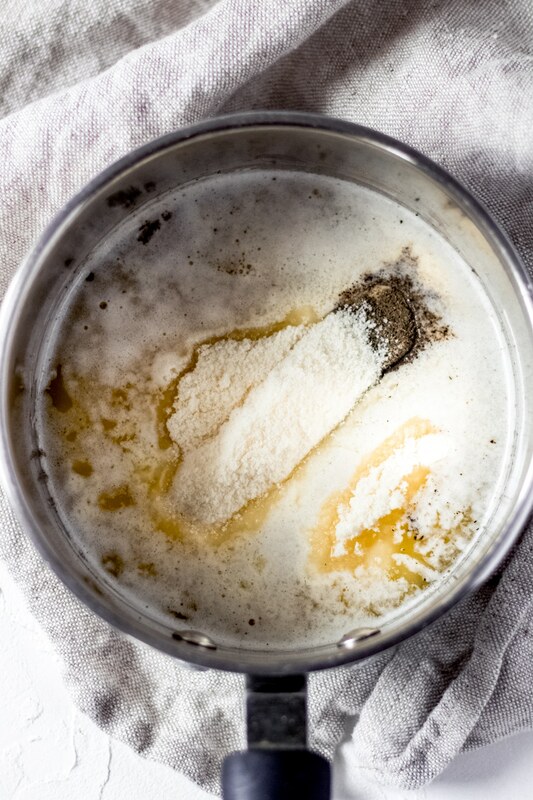 While the wings are baking, add the butter, 1/4 cup grated Parmesan cheese, garlic powder, and minced garlic to a saucepan and melt over medium heat. Stirring as it melts – then reduce heat to low. Once the wings have finished baking, remove from oven. Using cooking tongs, dip each wing individually into the melted garlic parmesan butter and place onto a plate or serving platter. Sprinkle the additional tablespoon of grated Parmesan cheese over the wings, and garnish with chopped parsley if desired. Wings should reach an internal temperature of 165 degrees. F.
If you want to increase the garlic flavor – increase the garlic powder by 1/4 teaspoon at a time until you reach the desired garlic flavor.